"Roses are Red my Love"
With just a tap of the hand, This 29" Balloon sings "Roses are red my love, violets are blue, sugar is sweet my love but not as sweet as you...". This Jumbo size balloon is filled with helium and will play up to 50 plays approximately 20 seconds long. 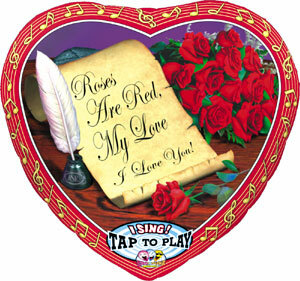 Option #1a: A simple but cute arrangement including the 29" Jumbo Roses are Red My Love Sing-A-Tune Balloon, attached to Valentine's Chocolates and four Love Coupons in a gift bag, $25. Option #1b: A Stunning Bouquet including the 29" Jumbo Happy Birthday Sing-A-Tune Balloon, a mix of Nine-11" Decorator and Solid Colour Latex Balloons attached to a Foil Weight, $37. Option #2: This bouquet arrives with the 29" Jumbo Roses are Red My Love ~ I Love You! Sing-A-Tune Balloon, Five-18" Solid Colour Foil Balloons attached to a Foil Weight, $40. Option #3: This bouquet arrives with the 29" Jumbo Roses are Red My Love ~ I Love You! Sing-A-Tune Balloon, Four-18" Solid Colour Foil Balloons and Seven-11" Decorator and Solid Colour Latex Balloons attached to a Foil Weight, $50. Option #4: This bouquet arrives with the 29" Jumbo Roses are Red My Love ~ I Love You! Sing-A-Tune Balloon, One Dozen - 11" Decorator and Solid Colour Latex Balloons attached to a gift bag full of candy, cookies and chocolates, $60. Option #5: This bouquet arrives with the 29" Roses are Red My Love ~ I Love You! Sing-A-Tune Balloon, Seven-18" Solid Colour Foil Balloons attached to a gift bag full of candy, cookies and chocolates, $66. Option #6 ~ For the Special Lady: This bouquet arrives with the 29" Roses are Red My Love ~ I Love You! Sing-A-Tune Balloon, Four-18" Solid Colour Foil Balloons and Seven-11" Decorator and Solid Colour Latex Balloons attached to a Wooden Treasure Box filled with Upper Canada Bath & Body products, $78. ID#B0286-02 $40 Valentine's Day Website Special $38 - Please mention when ordering to receive discount. ID#B0286-03 $50 Valentine's Day Website Special $48 - Please mention when ordering to receive discount. ID#B0286-04 $60 Valentine's Day Website Special $58 - Please mention when ordering to receive discount. ID#B0286-05 $66 Valentine's Day Website Special $64 - Please mention when ordering to receive discount. ID#B0286-06 $78 Valentine's Day Website Special $76 - Please mention when ordering to receive discount.